The Simms Women’s Guide Jacket is a women’s guide jacket by Simms that is made with the innovative 3-layer Gore-Tex soft fabric that is waterproof, windproof and breathable and the perfect fabric for a women’s guide jacket. This women’s fishing jacket is also constructed with a 100 percent polyester face. The Simms Women’s Guide Jacket has contoured design lines and sleeve articulation that provide a women’s fit that work perfectly with the highly breathable Gore-Tex shell fabric that this women’s fishing jacket is made of. The Simms Women’s Guide Jacket is designed with 4 storage pocket that includes 2 zippered chest pockets, 1 internal stretch-woven pocket and 1 large back storage pocket, which means that this women’s jacket will have plenty of storage space to store all of your women fishing gear. 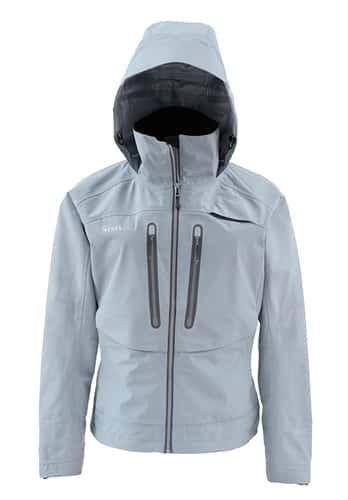 This Simms Women Guide jacket also has a watertight Shingle Cuff design that eliminates line catching, so women fly-fisherman can rest comfortably knowing that this women’s guide jacket has a clean design so you can focus on fishing and not whether your fly line will be catching on your women’s jacket. Finally, this guide jacket for women contains YKK VT9 AquaGuard Vislon main zipper and matching tippet pocket zippers included with this women’s guide jacket. This Simms Women's Guide Jacket is great, all aspects of this women's guide jacket by Simms is great. It looks great, feels great, keeps me dry, warm and lookin' good out on the water, so thanks Simms and Platte River Fly Shop! This Simms Women's Guide Jacket is the perfect guide fly-fishing jacket for women and is designed perfectly in every way. No complaints whatsoever, this women's Guide Jacket is comfortable, looks great and keeps me nice and warm while I'm finished, can't ask for anything more. A must have for women fly-fisherman.